One thing you may not know about me is that in college I studied Music Therapy. I’ve loved music since as long as I can remember… As a matter of fact, if I ever wrote an autobiography it would have to be an audio-book, because so many of my memories are connected to songs and I’d just have to include them! I’ve always known and believed in the power of music – to heal, to make connections, to inspire and encourage. When I work around the house, my kids and I often crank up a song or two to get us moving, and when I write or think I usually have some sort of music playing in the background… Even Michael Hyatt listed “Put on some upbeat music” as tip #1 in his post “5 Tricks to Boost Your Mood“! You mean that doesn’t ever happen to you? On a somewhat slower and quieter vein, this song reminds me that His Grace is not only what I need…it’s ALL I need! I want to be living proof that grace wins every time, too! Sometimes I feel most down when I’m thinking it’s all about me (even though I’ve read “Purpose Driven Life” and I KNOW it’s NOT!). I find if/when I release myself from the equation and give it back to Him…well, let me just say He NEVER disappoints! At the very basis of my life and this blog, it is my sincere and constant prayer that HIS show shines through. When I see that happening, that is the. single. most. encouraging thing to me! Are you beginning to see a pattern here? Eyes off me and my circumstances + thoughts on Him and His mercy = encouragement and determination renewed! Keepin’ it real, I’m going through some pretty challenging times right now. I know it’s easy to read PatAndCandy sometimes and think we have it all together, but here’s a news flash: we don’t! And sharing this list with you helps me to renew my perspective and get back in the game…trusting Him with the outcome. There, that feels better already! OK, a few more… These ones are frivolous and fun, but inspiring nevertheless! From the quintessential “overcomer” movie, Rocky. I may be giving away my age ;-), but nevertheless, this one gets my blood pumping and the adrenal rushin’! OK, this song is oh-so-silly, but really, once I’ve been through all the others above, I’m ready for it! It (usually) brings a smile to my kids’ faces to see me singing and dancing around the kitchen, and all of that makes me, well, even happier! Download them as a playlist, pull them up on your laptop, and enjoy 30+ minutes of fun and inspiration! 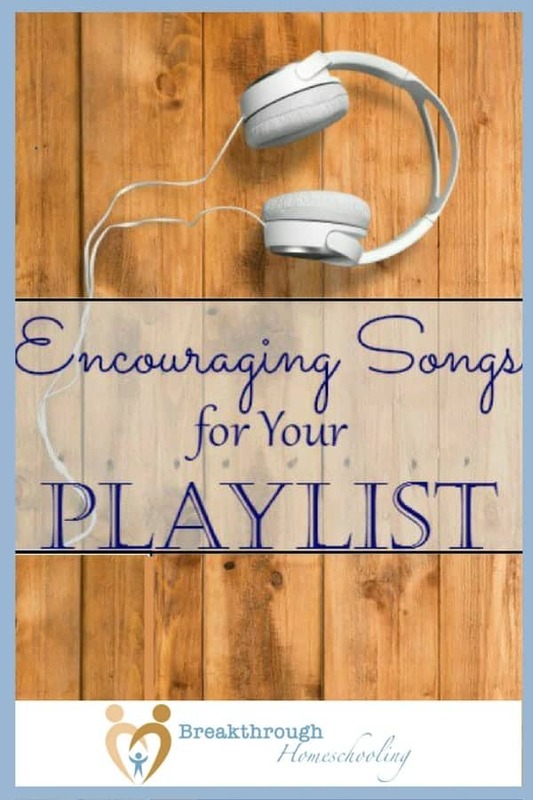 And if you liked this list, enjoy our second edition of encouraging songs! What tunes keep you motivated? Coffee and Conversation: Instant Pot Solutions! Getting your (homeschool) groove on! ← Need an (Instant Pot) Solution? Oh my goodness ladies! I can sit and find playlists of “encouragement” all day and find the crappiest lists ever. It seems Christian lately has been left out of positivity and it just keeps going down hill! I love the list you’ve thrown together here, and I really appreciate you taking the time to add on the video embedding. It helped jog my memory for a couple (like fight song). And let me tell you – as I sit in the pediatric ward of the largest Chldiren’s Hospital in the region right now, I’m greatful this site came across my screen (LEFO link up)…. I needed a few of these playing in my life right now! What a wonderful idea to make this list. I am here listening and writing, I may have to live on your site. Thanks for bringing this positive message and music to Blogger’s Pit Stop. I look forward to what else you have to share with us. We love to see you enjoying the blogging experience and we want to help you do that. You are more than welcome to park yourself on our site as long as you’d like ;-)! This list is really nice, a good collection of motivational songs. I like the Mandisa – Overcomer the most. These are great songs! I have most of them and you’re right they are very uplifting. Thanks for sharing. Thanks, Kristina! Glad to hear you enjoy them too…always nice to “meet” a kindred spirit!